Last June was the 27th anniversary of one of the largest protests in history, when upwards of one million people gathered on the Great Lawn in New York’s Central Park to rally against nuclear weapons while the UN held a Special Session on Disarmament. Two days later 1,600 demonstrators were involved in acts of civil disobedience at the consulates of five countries. I met him at the Brooklyn Bridge March for Climate Leadership, which was one of 5,000 plus actions that took place on October 24, the 350-organized International Day of Climate Action. Although very little came of the march, it ended up being a great opportunity to hear Jonathan trace his interest in the issue back to when his good friend Bill McKibben first started writing about global warming two decades ago. Not long after that, we sat down for a more formal discussion of climate activism. 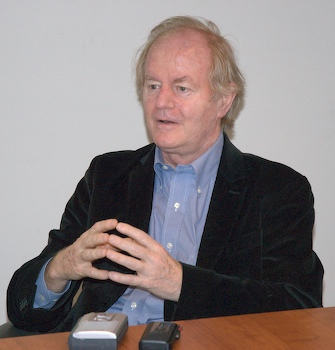 Drawing from his deep knowledge of nonviolent movements–which was the focus of his 2003 book The Unconquerable World–Jonathan offered tactical suggestions for climate activists, compared the threat of climate change to nuclear war and spoke of the general mystery surrounding the rise of mass public movements. Bryan Farrell: Why has it taken so long for a climate justice movement to emerge. Jonathan Schell: We just haven’t seen all that much in the way of social movements recently. We had the anti globalization movement in late 90s which flared up and died away. We also had the antiwar movement against the Iraq War but that also has kind of died away. There just hasn’t been much energy in social movements. Why that is is a very deep question. It’s a crippling disability when it comes to changes in policy that are on a deep and fundamental level, whether that’s changing the economic system or opposing these wars and the whole imperial mindset behind them or addressing global warming. If you just look historically, it’s very hard to find fundamental change in policy that wasn’t preceded by a very powerful social movement. So if you don’t have that card in your deck, I think it’s incredibly difficult to get fundamental change. In terms of public awareness [climate change] has been stronger than some of the other movements. Certainly it’s been longstanding and there are lots of strong organizations. BF: What do you think of Bill McKibben’s group 350, which has created a global movement around a number that defines a stable climate? JS: They’ve done better with the number than anyone else has done thus far. That speaks well for it. The specificity has a virtue. It sort of takes you out of a certain fog and establishes a clear benchmark for success. But it has its disadvantages. The number doesn’t itself appeal to emotion or spirit. It’s not self explanatory. BF: What did you think of the Brooklyn Bridge March? JS: There was a lot of emphasis on the pictorial. But I think it’s just great that some form of public movement has got going. It’s been a missing element for some years and, after all, we’re facing the most dire threat there’s been since the nuclear threat, which still exists by the way. BF: Do you think it would have been any more effective if the march had taken place on the lanes of traffic rather than on the pedestrian path? BF: What other avenues of protest do you see as being effective for climate activists? JS: Boycotts may be one of the tools of the nonviolent arsenal. It would be highly appropriate and perhaps rather effective if people were to organize boycotts of coal and pay a higher price for the alternative. But that assumes what we don’t have: a very lively public. BF: Bill McKibben recently characterized the climate movement as “dispersed in a disempowering way–individual actions don’t add up to enough.” How can a movement overcome this problem? JS: There’s no good answer. I think one of the most mysterious phenomena is the rise of mass public movements and it’s easy to say that you have to organize and do this and that, but sometimes you do those things and you get a response and sometimes you don’t. For 70 years the Soviet Union continued along and then one day the Solidarity Movement came along and the whole thing was history. What made that moment? Or with the civil rights movement, Jim Crow went on for 100 years until MLK and others formed a movement. Then there’s the Antinuclear Movement, where suddenly in the 1980’s you have a freeze movement. A million people protested in Central Park. But then it faded away. Public engagement just seems to come along in its own way. BF: Are there any nonviolent case studies the climate movement should follow? JS: The examples are the obvious ones. All of Howard Zinn’s book is crammed top to bottom with examples. The Women’s Rights Movement, the Civil Rights movement, the Antinuclear Movement, Gandhi’s movement, the Solidarity Movement in Poland. They show you that if you can get a movement going you can win with it. Power is there at your fingertips if you could reach out and summon it up. There’s no lack of knowledge about what to do. It’s not a secret what these movements have done. Each time there’s something a little different and the key is to figure out what that is for this movement. Seeking a nuclear freeze was the right instrument for its movement. History shows you can spectacularly succeed. BF: How does the climate threat compare to the nuclear threat? JS: They are two of a kind. They’re both threats to species including our own and mutilations of the Earth which is all that we have. The difference is really between detroying ourselves instantly [with a nuclear war] or doing it more slowly with global warming. It’s a threat of a new order and death and magnitude. I think the nuclear danger was an alarm bell for the environemnt. BF: Is one more solvable than the other? JS: Both are solvable. The nuclear danger is more easily solved. It can be gotten rid of without making any sacrifice. It doesn’t have the economic dimension that global warming has. BF: What lessons should the climate movement take from other social movements before it? JS: If you want things to happen you need masses of people to change them. That’s the lesson of the last century. But we have not been dipping our bucket in that well. The real energy crisis is the failure to mine the energy that is locked up within each of us. This is the missing ingredient. How that came to be, I don’t know. We’ve got to begin tapping that kind of energy. Nothing can be solved without it. One of the most frustrating and baffling things about public concern and movements and action is that there’s no sure fire way to trigger it. You can make your case before the public and they either take it or they don’t. But if you’re in a time when the general public is lethargic, the whole process is given over to the powers that be their interests. The main problem is that we haven’t succeeded in galvanizing the public will. One huge exception to this was the Obama campaign because that did tap into public energy. That did have a movement aspect to it. It was something quite new and different. We’re used to movements that grow up outside the electoral sphere. This came about within the electoral sphere and had a tremendous power, but it had its sharp limitations as well. It meant staying within the bounds of conventional wisdom. But it does show that it is possible for people to get out and do things.